A Retellian freighter was a type of freighter used by the Retellians in the 22nd century. Retellian freighters were designed to operate with a mere crew of two: a pilot and an engineer. The layout was composed of a primary spinal section, with six cargo bay sections, three on each side. Inside, the cargo bays were all separated from each other, connected by the central core of the ship. Each cargo bay had access to a series of Jefferies tube-like access ways, and partial access to internal sensors. Access to internal sensors could also be achieved inside one of the access tubes, which also led to the shuttlebay, which contained two one-man escape pods. The freighters maximum speed was about warp 2, but ambitious captains could get it to go to warp 2.2. Its thruster assembly were two symmetric triangles on its aft section. Although normally thrusters firing weren't visible except for a small yellow glow, when the thrusters were firing at full power a strong yellow glow could be seen. Two protruding sections below the thrusters were warp nacelles, which could take heavy damage, to the point of making an enemy believe the ship had been disabled, and still function. Two protruding ports above the thruster packs were similar to Bussard collectors, and in the event of an emergency could release substances such as ionized pyrosulfates and dilithium hydroxyls. In the final draft script of "Precious Cargo", this craft was described as "small, weathered." The Retellian freighter was designed by illustrator John Eaves. He referred to it as "a fav to work on!!! A real frumpy ship with a real gritty slice of external piping and details." 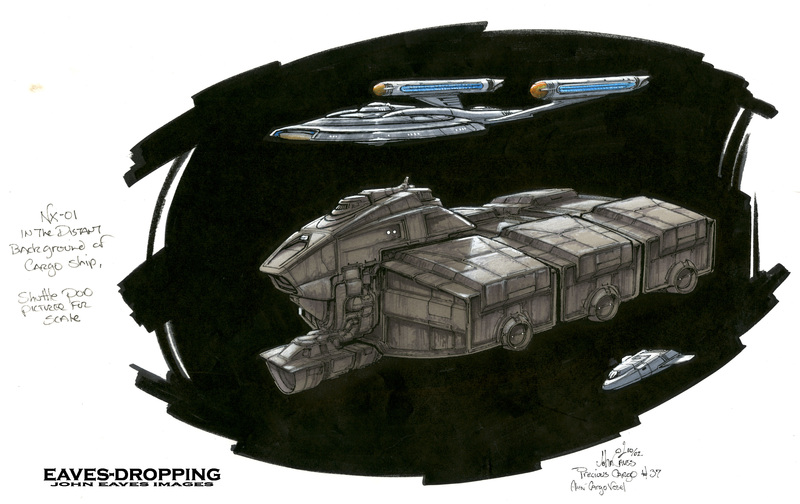 Eaves produced a concept sketch for the Terellian freighter, with Enterprise and a shuttlepod alongside it. The image can be seen here. For more information on this studio model, please see ENT studio models.